2000 / Me / NT / 98 / 95 ..
FieldNotes is a fully-featured yet easy-to-use wildlife recording application for organising your field observations. FieldNotes offers an intuitive (experience-based) data-entry format, an extensive range of ready-to-use tools for processing records, and automated data-sharing with wildlife organisations. Wildlife recorder: keep track of your key observations (species, sites, habitat description, pictures, and more). Map creator: transform your observations into publication-quality maps that summarise your recording activities. Report maker: share your observations quickly and easily through documents and web-pages. Record sharing: get involved in local and national recording schemes by exporting relevant observations. FieldNotes also offers the simplicity of wizards that make it easy to set up and use the database efficiently. - software for Windows 7, Vista, XP, 2003, 2000, Me, NT, 9x.. Simple, easy-to-use: Automated setup and the user-friendly interface let you easily and quickly start organising your wildlife observations. Matches your recording requirements: Record as much (or as little) information as you wish with FieldNotes unique experience-based interface. Quickly access your data: You can view stored data in a variety of ways. Table-view allows you to display data in rows and columns. Browser-view allows you to view data in data-entry forms. Report wizards allow you to collate selected records into documents and web-pages. Easily process data: Create quality, professionally looking documents, web pages and maps with color and graphics. Share your observations: Data-export wizard lets you contribute subsets of your data to wildlife organisations and recording schemes. Data browsers: Familiarise yourself with standard taxonomic systems, environmental classification schemes and biodiversity priority lists. 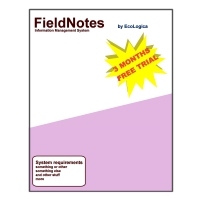 Try FieldNotes at home or in your office for 60 days risk-free. If it doesn't meet or exceed every single one of your expectations, we insist you return it for a courteous, no questions-asked refund.
" Probably the most attractive application I have used - the presentation is breathtaking. " " I want you know that this is definitely the best Wildlife recording software I have come across, and certainly well worth the price. " " ... a very user-friendly GUI [and] a feature rich application. " " an invaluable learning resource... "